Aquatic noxious species are non-native species that have been introduced into Victoria. These species have the potential to rapidly spread and invade native habitats and environments. If they become established, aquatic noxious species can feed on, or out compete, our native aquatic wildlife and can seriously affect fish habitat and fish stocks. Click here for a full list of aquatic noxious species found in Victoria. Pests are almost impossible to get rid of once they have arrived, so it is much more effective to stop them spreading in the first place. Anyone using inland or marine waters can help. You can help prevent the spread of aquatic noxious species by following the 9 D's of deterring pests. After each fishing trip, check, clean and dry your boats, kayaks, jet skis, fishing gear, ropes, anchors and wetsuits. Remove any attached weed, animals, water or sediment and put it in a bin (do not put it back into the water). Thoroughly wash your boat and gear after each trip with fresh water in your yard or in a carwash. Drain all the water from your boat and gear onto the ground. Do not let it drain back into a waterway (tiny eggs and plant spores can survive for months in damp areas). Use the image below as a guide for key areas to target. When washing your boat and equipment, be sure to thoroughly flush it through with fresh water. Where appropriate, apply an authorised antifoulant to your boat, kayak or jet ski. Ensure your entire boat and all equipment is completely dry before putting it away. Using live aquatic species as bait is illegal, and can cause major damage to Victorian waters. Click here to learn about what bait you can use in marine waters and click here for freshwater bait tips. Don't put unwanted bait into the water. Please always dispose of it thoughtfully. Please do not collect or remove suspected aquatic noxious species (except for European carp) as some native species can easily be mistaken for noxious species. Please report any suspected sightings of aquatic noxious species if you see an aquatic noxious species outside of its known range. If you do, please take a photo and make a note of the date, time and location and email this info along with your name and contact details to marine.pests@ecodev.vic.gov.au or phone 136 186. Parks Victoria have also put together a great video with further helpful tips. The Northern Pacific sea star is commonly found in Port Phillip Bay and is a marine pest in Victoria. A threat to fish stocks and the marine environment, these sea stars release millions of eggs and can grow a full body from a single arm. They are often mistaken for native species, so make sure you can tell the difference. 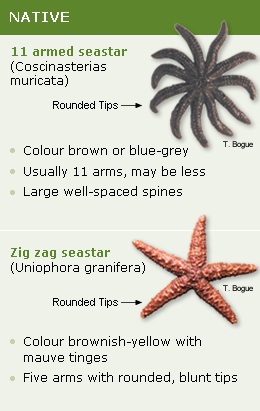 The graphics to the right are a great guide to help you identify the differences between the Northern Pacific seastar and native species such at the 11 armed seastar and the zig zag seastar. 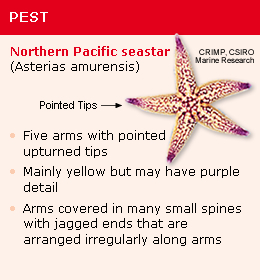 If you think you see a Northern Pacific seastar outside of Port Phillip Bay please report it.